Collecting Barbie dolls … a question of the value? I have heard many of my fellows collectors talking about this topic. To be honest it’s no easy to answer the question. Is it a good store of value? Is it a bad store of value? Should we consider it as store of value? In my opinion we shouldn’t consider it as store of value. I collect Barbie dolls because I like the option to have a possibility to have fashions from the most different decades in one room. I don’t collect because of the monetary value. It’s the most important reason to have fun with your collection. I had this problem in the last months more than once. I saw a Barbie doll body or a piece of outfit I liked and wanted to buy it. I asked the seller if he would ship to Europe and most of them said no. It’s a good question what to in this situation. Well, I solved a part of my problem in the way that I bought some Vintage pieces (in poor condition) and disassemble the piece in which I’m quite good. 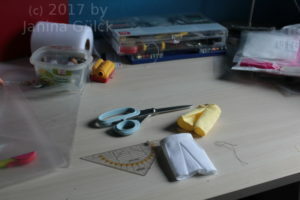 I also understand how to make a pattern for clothes and did copy the pieces of fabrics to create a paper model. This allows me to copy the piece I want and I’m not depended on the sellers from the US. I like to keep it as originally as possible but I can also include my own ideas and wishes. At the moment I’m experimenting with different pieces. For some of them I used a pattern and did others from own ideas. I know my workshop is a bit of chaos but I need my chaos to be creative. Stay tuned in. Next week you gonna see more of my sewing project.